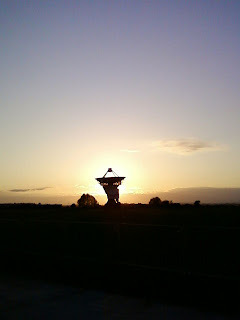 Today here's wonderful shot of sunset behind the 25m dish at Chilbolton along with a background explanation from The Chilbolton Observatory Website. This is the view of the Chilbolton 25m dish, as seen from the LOFAR site. The story of the Chilbolton Observatory is a tale of engineering triumph. A project that was as ambitious in its day as the Greenwich Millennium Dome, the Chilbolton Observatory was opened in 1967 amid great pomp and circumstance by the secretary of state for Education and Science. The ceremony was a celebration of a landmark project, the culmination of a two-year effort to design and construct a stunning 25 metre radar antenna that dominated the rolling Hampshire landscape for miles around. It was designed to support the research aspirations of the prestigious radio and space research station for decades to come. Today, the grand old dish stands sentinel on the horizon of the new LOFAR project.